From 1st January 2017, Lion and Eve, 90,000 panels and 400 industry experts between them, will be rebranded Live, two letters from each company reflecting a ‘responsive’, ‘immediate’, ‘switched on’ mantra. Dale Robinson, who left Eve to found and run first TPA then Lion, will manage the business. Months in the planning, and subject to a rigorous process by the Competition and Markets Authority, Live is a perfect mix of client focus, inspiration, legacy (Eve turns 50 this year) and venturesome spirit. Richard Thomas, Managing Director, Specialist Products Division at A-Plant, comments: “It’s a bold decision to consign names such as Eve and Lion to history, but we want all our staff, as the shop window of the business, to feel equally proud. A new brand is the best way of ensuring that happens. “This is a merger of equals. It’s two big, strong businesses coming together, combining a huge amount of skills, knowledge and expertise, and we’re going to be a very compelling, solution-based proposition for our customers. A-Plant investment will see more aluminium panels coming on stream and a concerted effort to grow Lion’s German business under the Live banner and develop a European market, which has been slow to adopt an engineered trackway solution. A-Plant has made a similar commitment to Eve’s barrier and fencing division, which includes the iconic Super Fortress Fence used at Glastonbury Festival and will be another telling part of the Live portfolio. While Eve and Lion will continue to trade for the rest of 2016, the new brand will be unveiled at the Showman’s Show in Newbury this week. Launched in 1966 by Dale Robinson’s father, John, Eve Trakway designed, developed and delivered the first track panel, primarily to the construction industry. Eve went on to establish itself as the biggest supplier of temporary access in the UK. With aluminium, plastic and timber trackway systems, pedestrian and vehicle bridges, barriers and fencing stored at service centres across the country, multi-award winner Eve provides for profile live events, energy and infrastructure projects. A-Plant bought Eve in May 2013, going on to make a significant investment in the business that doubled its stockholding. 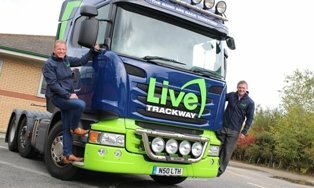 Introduced to the market in 2009, Lion Trackhire was a project by former senior engineers from Eve. Quickly establishing a reputation for the quality of its kit and service, Lion won major contracts in live events, as well as transmission projects, rail and renewable energy. Along with numerous event industry awards, Lion ranked in the upper echelons of the Sunday Times Virgin Fast Track 100 from 2013 to 2015 inclusive and was named a National Champion in the European Business Awards 2015/16. John Robinson continues to consult on panel design for Lion.